The Mi’kmaq-Wolastoqey Centre at the University of New Brunswick is hosting its third annual Peace and Friendship Treaty Days on Oct. 23 and 24, examining the contributions of indigenous political traditions to Confederation. On the 150th anniversary year of Canada’s Confederation, the event will feature a keynote speech by Nova Scotia Senator Dan Christmas – the first Mi’kmaw to be appointed to the upper chamber. Senator Christmas, sworn in as an independent last December, has been active throughout his career with a number of international, national, provincial and local agencies in a wide range of fields including aboriginal and treaty rights, justice, policing, education, health care, human rights, adult training, business development and the environment. The public is invited to attend his keynote address on “re-reconciliation” on Monday, Oct. 23 at 6:30 p.m. at the Wu Conference Centre on UNB’s Fredericton campus. – University of Calgary law professor Kathleen Mahoney, who served as chief negotiator for aboriginal peoples’ claim for cultural genocide, achieving the largest financial settlement in the nation’s history for the mass human rights violations against the indigenous peoples of Canada. She was the primary architect of the Truth and Reconciliation Commission of Canada and led the negotiations for the historic apology from Parliament and from Pope Benedict XVI at the Vatican. 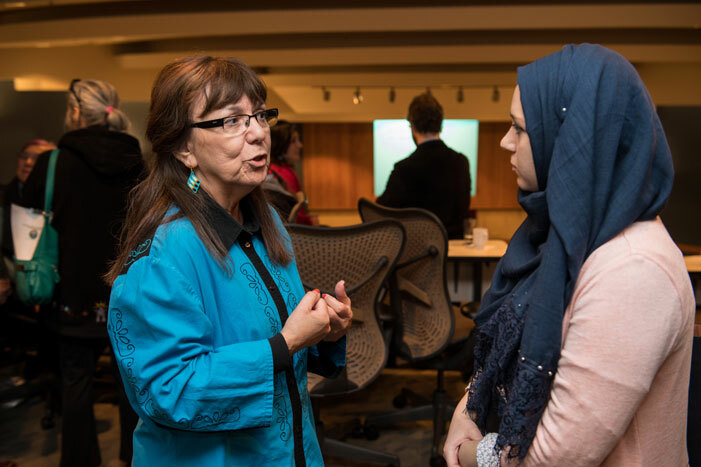 – Marilyn Poitras, an assistant professor of law at the University of Saskatchewan who was appointed, and later resigned, as a commissioner from the National Inquiry into Missing and Murdered Indigenous Women and Girls. Her expertise and passion are around constitutional and aboriginal law with a life study of customary laws. Her legal career began as a native court worker and moved into the area of constitutional law after articling with the Saskatchewan Department of Justice. She has developed a number of legal education initiatives. – Pam Palmater, a Mi’kmaw lawyer, author, social justice activist from Eel River Bar First Nation. Currently holding the Chair in Indigenous Governance at Ryerson University, she has been volunteering and working in First Nation issues for more than a quarter century on a wide range of issues like poverty, housing, education, aboriginal and treaty rights, and legislation impacting First Nations. She was one of the spokespeople and public educators for the “Idle No More” movement in 2012 and 2013 and has continued her public advocacy in many forums since then. – Imelda Perley, elder-in-residence at the University of New Brunswick. She is a Wolastoqew (Maliseet) from Tobique First Nation, St. Mary’s First Nation and Houlton Band of Maliseets who serves as a cultural adviser for community organizations, provincial and federal agencies. She teaches Maliseet language and Wabanaki worldview courses at UNB and the University of Maine and co-teaches a native studies module at St. Thomas University. She is founder and coordinator of the Wolastoq Language and Culture Centers Inc., situated at Tobique and St. Mary’s First Nations.